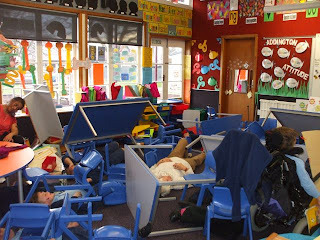 The junior school was hit pretty hard by a very localized Earthquake on Tuesday with desks and chairs tipping over and injured staff and students everywhere. Luckily for us the senior children were safe and sent to assist where they could in the junior school. 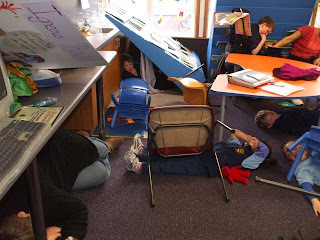 All this activity was filmed by staff and used as an amazing discussion tool about disasters. All we can say is that it was a good thing that our whole school topic for this term is set around answering the big question of how to survive a disaster. The students all agreed that we are not prepared and we need to do a whole lot of work to find out how we can be. This should be a very interesting topic, one that will generate much discussion at home.